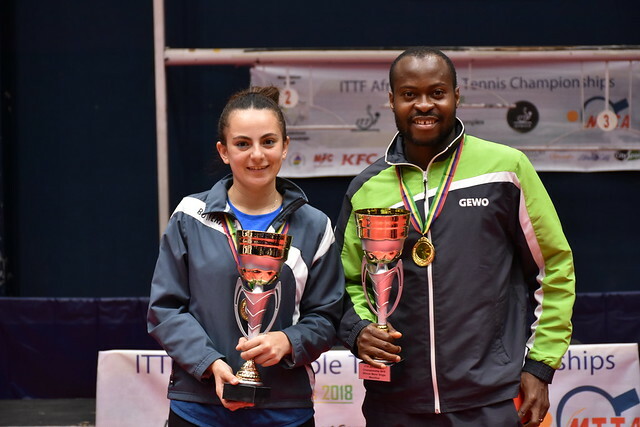 First place in the group secured the previous day, a semi-final place in the Men’s Team event at the 2018 ITTF-African Championships in Port Louis, Mauritius reserved, for Nigeria, the top seeds, the immediate goal had been achieved. On the second day of action, Egypt, the second seeds, had one initial phase fixture to complete, as did Algeria, the third seeds. Egypt faced Madagascar represented by Zo Razafindralambo, Setra Rakotoarisoa and Rado Rasolomalala; fielding the trio of Youssef Abdel-Aziz, Khalid Assar and Mohamed El-Beiali, a three-nil win and a passport to the penultimate round was duly achieved. The outcome was as expected; the future for Algeria was less clear. In their concluding group stage fixture they confronted Togo, both teams entering the contest unbeaten. A close engagement was anticipated; Algeria’s Larbi Bouriah, Sami Kherouf and Mohamed Lazazi had other ideas. They recorded a three-nil win, Togo fielding Mawussi Agbetoglo, Soudes Alassani and Kokou Dodji Fanny. Success for Algeria, a quarter-final place beckoned; no changes to the selection, a three-nil win was recorded against South Africa’s Theo Cogill, Kurt Lingeveldt and Shane Overmeyer, before progress was halted abruptly in the penultimate round. Once again the same three players on duty, it was a three-nil defeat at the hands of Nigeria who, for the first time in the tournament, fielded Quadri Aruna. He joined forces with Bode Abiodun and Segun Toriola. Defeat for Algeria, it was a resigned Sami Kherouf who reflected on the defeat. Similarly for Togo, who by finishing in second place in their group behind Algeria, had gained a quarter-final place, it was a resounding success followed by an equally resounding defeat. Mawussi Agbetoglo, Kokou Dodji Fanny and Fessou Lawson-Gaizer, recorded a three-nil win against the Mauritius outfit formed by Brian Chan Yook Fo, Rhikesh Taucory and Akilen Yogarajah before, with Atarou Assou preferred to Fessou Lawson-Gaizer, they suffered by the same margin. They were beaten by Egypt who selected Khalid Assar, Mohamed El-Beiali and Ahmed Ali Saleh. The Men’s Team final is set for 7.00 pm (local time) on Wednesday 5th September and follows the Women’s Team title decider.